Every year, the Linux conference (open source software) is held at various locations around Australia. This year it was held at the Australian National University in Canberra. Having a green focus, Linux ran the event with a small footprint and gave the attendees the option (when registering) to ‘tick’ the box to buy a tree for planting in the Canberra district. One hundred and eighty-seven people decided to take up this option. 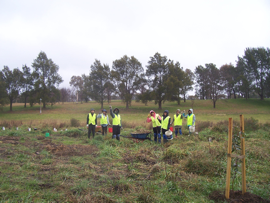 The trees were planted on the 17th July by the Ginninderra Catchment Group. ‘Thanks to a donation of trees from supporters of Fifteen Trees, members of the Mac Gregor Landcare Group and Conservation Volunteers Australia were able to plant close to 200 trees and shrubs. The planting adds to the work of an ongoing local restoration project to provide patches of high quality habitat along the Ginninderra Creek’. Damon Cusack, Water Watch Coordinator. Thank you to Micheal Still, one of the organisers of the Linux conference. Thank you also to the attendees who added another $5.00 to their tickets to have a tree planted on their behalf.